Argyris ((Harvard behaviorist) and Schon (MIT faculty) collectively researched adult learning, yielding important discoveries into how organizations develop, adapt, learn or fail, during continual change. This theory is also known as single and double loop learning. Their work on Learning Organizations has elevated executive and organization development to another level causing real learning to gain center stage in manager and organization development. “……out inquiry into organizational learning must concern itself not with static entities called organizations, but with an active process of organizing which is, at root, T cognitive enterprise. Individual members are continually engaged in attempting to know the organization, and to know themselves in the context of the organization. At the same time, their continuing efforts to know and to test their knowledge represent the object of their inquiry. Organizing is reflexive inquiry”. Theories-in-Use: Those theories that are implicit in what we do as practitioners. Espoused Theories: Theories which we call to speak of our action to others. “Our theory of action can enhance human activity, responsibility, self-actualization, learning, effectiveness….organizations will begin….increase the force toward learning and health. We present a view of man actively seeking to master himself and his environment in a way that makes organizations effective”. Single-loop Learning: When things go wrong, look for another strategy that will address within the governing variables. 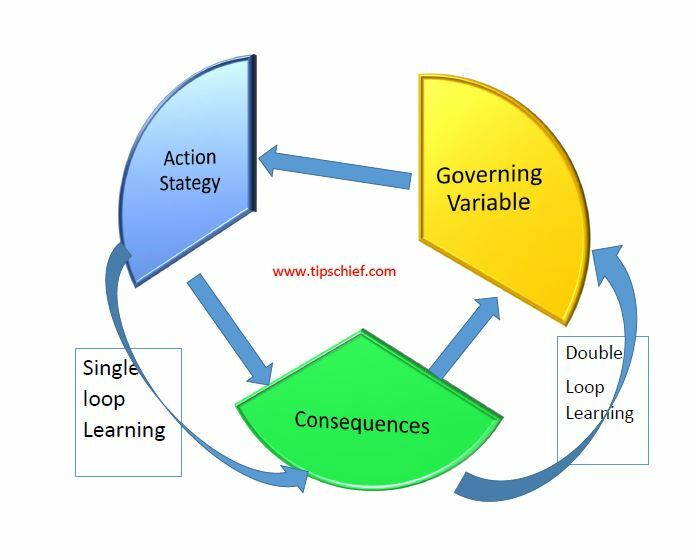 Double-loop Learning: Question the governing variables themselves; subject these to critical scrutiny; foster feedback.